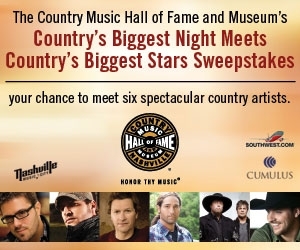 The Country Music Hall of Fame along with the museum in Nashville would like to send you to the CMA Awards next month in Nashville. This is your chance to meet some of your favorite country artists like Chris Young and Montgomery Gentry. Click on the image above and enter to win. The CMA Awards are the biggest award show country music has. They haven’t been kind to Toby Keith over the years, but they’ve awarded some of the best country stars in the world. There are a lot of big nominations this year. Stay tuned as we near the big day and I’ll share my picks on who I think will win and who should win. Until then enter and you could be heading to Nashville. This has been a terrible year for me. I have been laid off work since March and still have not found a job. I have also had a lot of medical problems and don’t have insurance. I really need a break. My daughter is graduating next month from FSU with a four year degree in Early Childhood Education and she is in need of a well deserved break also. Please allow us to win this wonderful sweepstakes.